As I discussed in my last post, Japan imported writing from China. However, these symbols – called kanji in Japanese – are morpheme-based, representing both sound and meaning. Thus kanji could at first only be used for writing Chinese. In time, however, a system for writing Japanese eventually emerged. Adaptation began with Man’yōgana. Named after the first anthology of Japanese poetry, the 8th century “Man’yōshū,” Man’yōgana are kanji used purely for their pronunciation, with no regard for meaning. They made it possible to write in Japanese, but they weren’t codified; to write the sound “a” for example, any character pronounced “a” could be used. Given that kanji number in the tens of thousands, this made for a cumbersome system. Nonetheless, it was a start, and Man’yōgana in turn gave birth to the two syllabic alphabets still used in writing Japanese today. 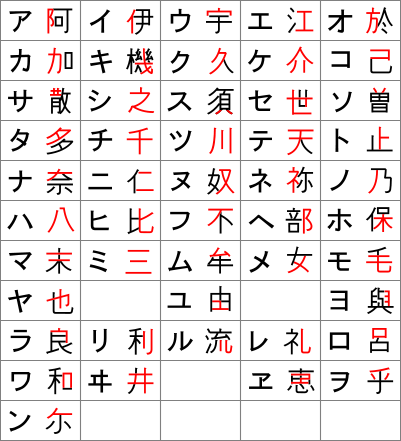 One of these syllabaries is katakana (like the other types of writing I’m talking about, the name refers both to the syllabary as a whole and to the individual symbols). Katakana were originally used for writing notes or pronunciation glosses in the spaces between columns of text. 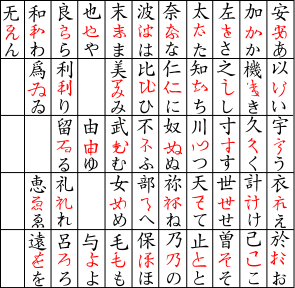 This meant that katakana’s symbols had to be simple, in order to fit into small spaces legibly. This chart from Wikipedia shows how katakana were created. In each cell katakana is on the left and kanji is on the right, with the parts used to create the katakana colored red. The other syllabary is hiragana. Hiragana was the direct evolution of Man’yōgana, created not by taking pieces of kanji, but by writing whole characters in a simplified cursive form. 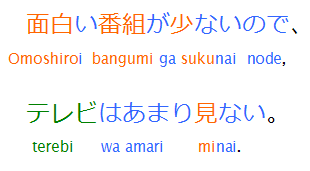 Furthermore, hiragana were used not for annotation, but for general writing. This chart from Wikipedia shows the evolution of hiragana. In each cell the original kanji is on top, the intermediate cursive form is in the middle in red, and the modern hiragana is on the bottom. Hiragana replaced Man’yōgana as the means of writing Japanese-language poetry and literature, but Chinese continued to be used for official documents. However, in these Chinese documents, there had to be a way of writing the names of Japanese people and places. Man’yōgana was one method, i.e. kanji could be used to spell out names. The other method was to use kanji for meaning instead of sound, and to then assign these kanji the native pronunciations. This approach became increasingly common, with more and more kanji acquiring a Japanese reading in addition to the original Chinese reading. In cases where it was unclear how a word was meant to be read, a gloss could be written next to it in katakana. As a body of native literature was written in hiragana, people got used to reading and writing in Japanese. And as it became more common to apply native Japanese readings to kanji, using katakana to annotate text when necessary, it became possible to write Japanese using these meaningful kanji. I’ll stop there for now. More on kanji and hiragana in my next post. You are currently browsing the Erratic Dispatches blog archives for February, 2010.